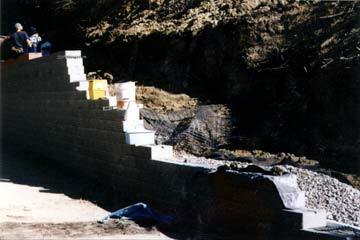 Interlocking retaining wall systems have been developed to last a lifetime, provided that proper design and quality installations are a part of the total wall project. Designs must be site-specific and critical, and unusual wall projects should be designed and stamped off by a local structural engineer before construction begins. Installations should always follow manufacturer's guidelines. An established professional wall builder should only install projects of major size or consequence. There are several reasons why a retaining wall may be needed or desired on a piece of property. In the Bay Area, poor soil conditions sometimes require engineered walls to stabilize the site. Hillsides are often cut out to provide a larger building or landscape site. Landscape architects often use retaining walls to complement exterior hardscape designs. Garden walls are installed by homeowners to provide attractive planters. Identify the size and scope of your wall project and determine the soils you will be working with in order to develop an efficient design that will last. Many projects have little information on the soils at the construction site. Start your project off in the proper manner and obtain a soils report for your project. Consider this your first and maybe your most important form of property insurance. The soils report will tell you what type of soil will be retained (soils friction angle), what the bearing capacity of the soil is, if any cohesion may be used in global stability calculations, and how much variation or types of soil are present on the site. Evaluate possible expansion plans to look at what might happen and plan your design accordingly. Determine if your final site plans require slopes above or below the wall or if terraced walls will be required. These situations normally require a design analysis with specific site engineering. For critical walls, always consult a design expert in your community. A thorough analysis and a stamped drawing from a local engineer will provide the best and least expensive form of insurance that you can find for your site development. It's very important to have the proper grading to direct water runoff away from your building. Retaining walls must be looked at in the same fashion. We have found that a major cause of wall problems can be directly attributed to improper water management. You must plan the location and grading around your wall project to ensure that water is diverted away from the wall. Most walls are not designed to account for the effects of a fully saturated soil mass. Important questions to consider to ensure that your wall project will be your last. What are the drainage patterns on your final site plan? Do underground springs of high water tables exist? Will adjacent properties or streets contribute to water runoff around your wall? 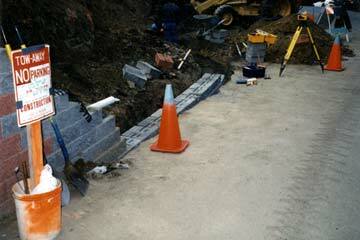 How can you vent the drainage system built into your retaining wall design way from the wall? Will local streams, rivers or lakes encroach on these walls? Will water flows ever completely cover any of your walls? Will there be excessive snows built up above your wall? Have proper provisions been made to channel down spouts away from the wall site. Is there an outside water spigot located above the wall? Up to this point of your project you have done everything correctly. Your site development has been properly planned and your walls have been efficiently designed. Now don't take the "penny-wise, pound-foolish" way out. Find a qualified professional wall installer for your critical projects and ensure that the requirements are properly documented and both parties understand how, when, and where your walls will be constructed. Ask for references, visit the job sites and check with the owner and the general contractor of each project. Present the specifications for the materials and methods of construction. Require documentation on the materials to be used on the project and the method of construction. Require lien waivers when payments are made. Insist on a pre-construction meeting to view the scope of the project, who is responsible for what, how, and when payments will be made. Always make it clear what your requirements are so that your contractor can do the job right the first time!